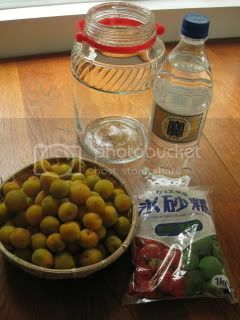 We've been making our own "Ume-shu" (plum liquor) at home past years. The plum season is late May to June. This year, we got tons of special plums from our friends in Bay Area, so I got to make different things with them. First thing was, of course, "Ume-shu". 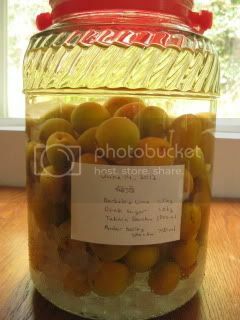 For the best results, it's typically made with green (under-ripe) plums, and that's what I've been using past years. 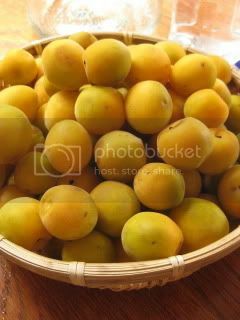 So, when I got those super-ripe yellow plums (smelled really nice), I was a bit worried, but I carefully selected unblemished ones and made the standard-ratio ume-shu. I'm looking forward to tasting it when it's ready next year. 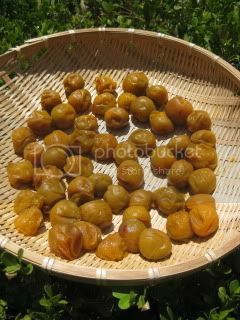 I also made another batch of ume-shu with regular green plums which I purchased from a store. 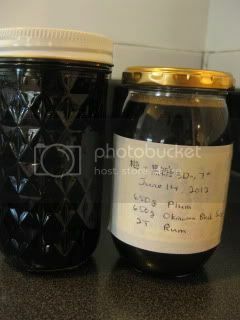 But this batch, instead of infusing with rock sugar, I used Okinawa "black" sugar. It's going to be very nice, also. 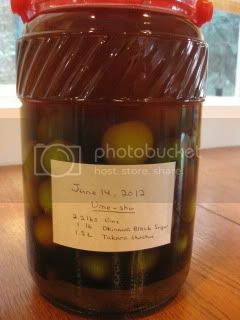 This is 3-day marinade Ume Syrup! 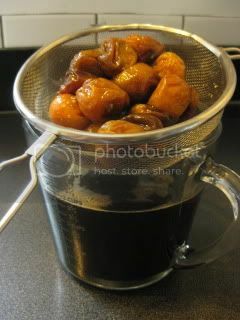 I simply marinated the ripe plums (650g) with the equal weight of Okinawa "black" sugar, and 2 tablespoons rum for 3 days at room temperature. The result was super aromatic rich syrup. I bottled them to keep in the fridge. It should keep for at least a month. 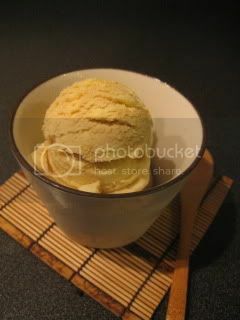 With this I made Ume Syrup Ice Cream. I made plain ice cream and swirled in the syrup at the very last stage in the ice cream machine. Amazing! 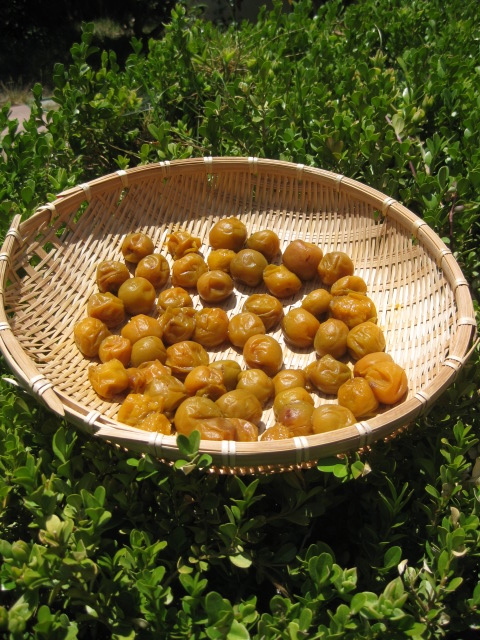 And, guess what, I even made my own Ume-boshi (salt-pickled plums)...which I've never acquired a taste of my whole life so far! 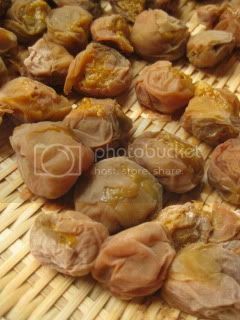 I just wanted to do it, especially because I wanted to make my own "Iri-zake" (very nice seasoning from Edo period...I will write about it next time), and also "ume-zu" (by-product of making ume-boshi...salty plum vinegar). 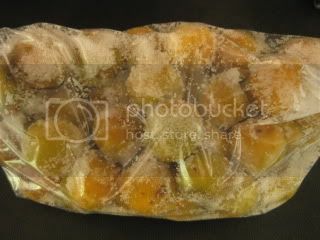 First, I marinated 1kg ripe plums in 150g sea salt and 50ml shochu (Japanese spirit) for 17 days at room temperature. After 17 days, the plums released so much juice! 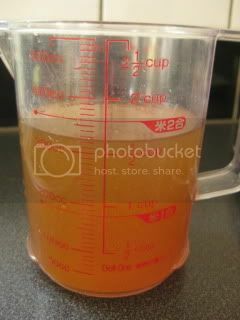 This juice is called "Ume-zu", and you can use it for marinade, making dressing, sauce, seasoning, etc. So, I saved it in the fridge.